For the past two or three years, I’ve been reading everything I could find about laying workers. 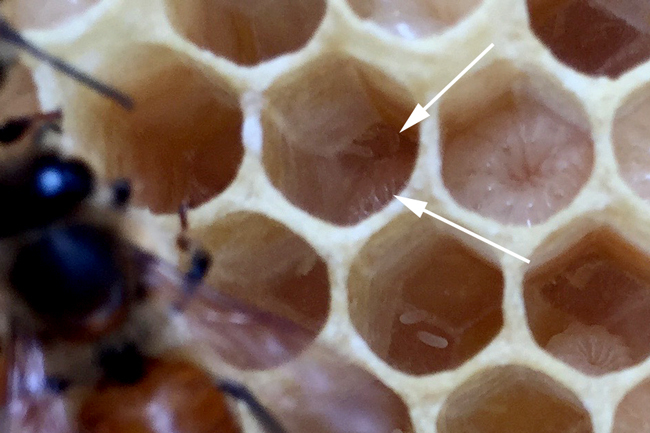 The biology of why a laying worker hive forms is pretty straight forward. But ideas on how to deal with them vary radically. Without actually keeping a tally, it seems to me that large-scale beekeepers mostly shake out the bees and move on. Hobby beekeepers often work diligently to save them. I don’t see a problem with either philosophy. When time is money—such as in a large operation—moving on is probably the best strategy. In a smaller operation, though, when the purpose is to learn about bees and beekeeping, playing around with one of these hives can be a memorable learning experience. The one exception, I think, is that if you have only two or three hives, you could seriously weaken one in order to maybe save another. For example, if you have two hives and you transfer a frame of brood from the queenright hive to the laying-worker hive every week for three or four weeks, you may seriously weaken your strong hive. Without going into detail, laying workers begin to show up roughly three weeks after a colony has gone queenless. Pheromones from open brood, and to some extent from the queen herself, suppress the workers’ ovaries. After loss of the queen, the brood is completely capped within nine or ten days, and worker ovaries slowly begin to mature. By the end of three weeks it is possible for some of these workers to begin to lay. Since the loss of pheromone affects all the workers, you may find dozens or even hundreds of these layers. Hives with laying workers are notoriously hard to re-queen, and often the colony will kill a newly introduced queen. Many factors determine the number of workers affected, including the size of the colony and the length of time the queen has been missing. Beekeepers have developed many different strategies to save these colonies. Some beekeepers have been successful by combining the laying workers with a queenright hive. Others succeeded by introducing open brood and gradually reversing the ovarian development. Once the bees start to build queen cells, some of these beekeepers have managed to introduce queens. Others have only had success by letting the colony produce its own queen. The different programs, successes, and failures are extremely interesting, but my purpose today is merely to show what a laying worker hive might look like. I’ve been working with a brand new beekeeper in Sydney who, four weeks ago, installed a package into a new Flow hive. The beekeeper, Edmun, was worried he had done something wrong because, after releasing the queen, he could not find her or any evidence of eggs or larvae. It wasn’t until he purchased a second hive and package that he was convinced that something was wrong with the first. The second colony took off, while the first continued to languish. Edmun supplied detailed information on all the steps he took to hive his packages. By the time I got involved, he was worried about the foundationless frames, the lawn mower, the coating on the hive, and the number of times he opened it. I can understand the anxiety here. When you’re new at this, you always question yourself and what you are seeing. As far as I could tell, however, he did everything by the book. Queens die sometimes in spite of what we do. But I was worried that too much time had passed, and that laying workers would show up any day. After I explained what to look for, he sent the photos below. Edmun did a great job with the photos, and I thought they would be a good learning tool for someone who has never seen a laying worker hive. At first glance, the new comb looks great. The bees are busy and the honey is capped with snow-white wax. 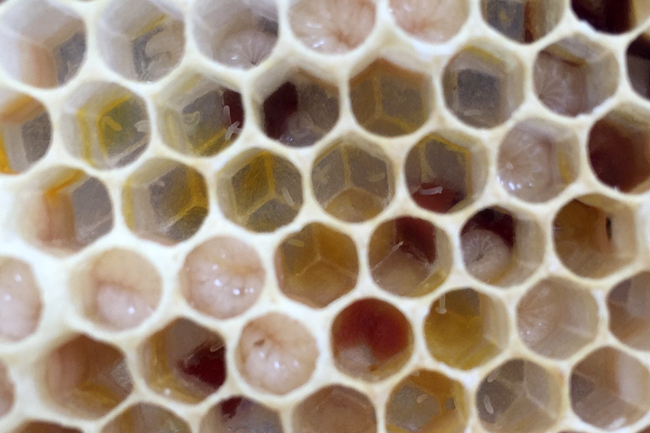 Below the honey, you can see some stored pollen and worker bees feeding fat larvae. However, on closer inspection you can see several signs of trouble. Many cells contain multiple eggs. The eggs are not centered in the bottom of the cells, but cling randomly to the sides of the cells. Some eggs are atop pollen. At least one egg appears to be on the rim of the comb. Some cells have more than one larva. Some cells have eggs and a larva. 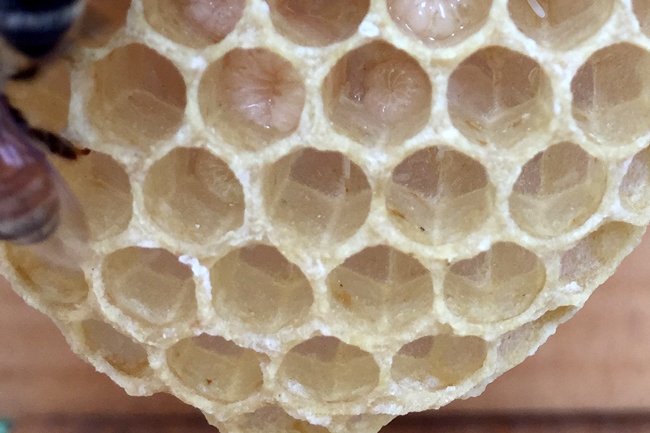 Capped drone cells occur randomly within the comb, whereas queens generally group drones together at the edges or bottom of the comb. In a normal colony, workers prepare larger cells for drones, but in a laying worker colony, the drone eggs are laid in worker cells. In places, the edges of the comb appear to be “reinforced” in preparation for capping drones. Drones require a large rounded cap, rather than a small flat one. Occasionally, a newly-mated queen will lay multiple eggs per cell during her first few days. Egg laying, apparently, is a learned skill. However, the other signs listed above will not be present if you have a normal queen who is just learning the trade. For example, she usually won’t lay on pollen, she won’t lay an egg in a cell that contains a larva, and she won’t lay eggs on the rims and walls of cells. If you see multiple eggs but no other suspicious signs, and if those multiple eggs are basically in the middle of the cell, wait for a few days to see if the problem clears up or gets worse. In general, you should not conclude you have laying workers based on just one of the signs listed above. Instead, look for several. For example, multiple eggs plus eggs on pollen plus two larvae in a cell would make me suspicious. I suggested a number of options for handling the laying workers, but ultimately Edmun decided to shake out the bees at the edge of his apiary to get rid of them. Since he only had one other hive, he didn’t want to weaken it by stealing brood. Combining the two was another risk he didn’t want to take. Instead, he was able to get another package and install it in the first hive. The episode cost him the price of another package, but I think Edmun learned a lot in the process. Yes, it would have been helpful to recognize queenlessness before it progressed into laying workers, but that’s how we learn and it’s all part of beekeeping. Although he might do it differently in the future, as a beginner with only two colonies, he made a good decision. At first glance, this comb looks fairly normal. A strip of nicely capped honey spans the top and the brood nest is below. There is one queen cup which is not unusual. But when you look carefully, you can see capped drone cells in the main nest. © Edmun Benyamin. Multiple eggs occur in many cells, often in the corners or hugging the cell walls. © Edmun Benyamin. In some cases, eggs or larvae lie on top of pollen. © Edmun Benyamin. This egg is perched on the rim of a cell. © Edmun Benyamin. This cell appears to have a larva in the lower right corner, and a much younger larvae just beginning to take on the c-shape in the upper right corner. © Edmun Benyamin. Reinforced rims support the large bullet-shaped cappings that cover drones. © Edmun Benyamin. There are many times when a newly raised queen will start laying multiple eggs in the bottom of each cell. This is often mistaken for a laying worker and beginners will often jump the gun and order and install replacement queens only to find them dead later and another queen laying instead. Great care should always be taken to make absolutely sure that a queen is indeed not present BEFORE thinking of replacing. I have found myself the victim of selling someone a queen then blamed for selling defective queens when they thought their colony was queenless only after installing that queen find out what kind of tragic mistake was made not inspecting their colonies thoroughly enough to varify whether the colony was actually queen right. Beekeeping is not as easy as many might think…and the bees are actually the ones in charge, not the beekeeper!!!! Luckily I’ve never had to deal with this but I’ve read up on it in preparation for the day it would happen. I’m thinking my idea would be to to take a frame of open brood from a QR hive and put it in the LW hive. If possible, swapping out some frames of stores in hopes that the frames from the QR hive would have some traces of the brood pheromone on them. Wait about two days and combine the two hives with a double screen board. I’m thinking I’d want the entrances facing the same direction, so as to increase the amount of drifting the flyers do between the two hives. Anything I can think of to homogenize the hives. I’m thinking the queen excluder would keep the queen from wandering into hostile territory and keep her surrounded by her own sisters, as an extra layer of security. At this point the workers from both hives should start mixing together and start rearranging the stores and honey in the hive. And even if the LWs aren’t suppressed by this point, many would be at or near the end of their life span. I’d want to do all this with a thriving QR colony instead of a nuke, so that the sheer numbers of bees in the QR colony would make it the dominant colony, from the start. I’d also want to get rid of any viable drone brood from the LWs, to help cut down on passing the genetics along that would make LWs more likely in the future. Any holes in any of that? It’s not a hole, but my objection is to your last paragraph. First, I doubt that getting rid of the laying workers’ drones would lessen the likelihood of laying workers. The problem is caused not by worker genetics, but by the lack of pheromones. If workers could not lay, the hive would just die. But since the workers can lay, they pass their genetics on to the next generation through their drone offspring. From an evolutionary point of view, this has benefits. Let’s say you had an exceptional queen—good honey producer, gentle, hygienic—or whatever. Then that queen dies for some reason unrelated to her health. Let’s say the beekeeper kills her with a hive tool and doesn’t realize it. Without laying workers, her good genetics will just disappear. But if you have laying workers, portions of her good genetics get passed on into the general population through her daughters to the drones. In other words, parts of her good genetic line are conserved instead of lost. Evolutionary biologists believe that a lot of the animal kingdom’s “last ditch efforts,” such as laying workers, are nature’s way of ensuring survival by conserving a varied gene pool. So while the system is antithetical to beekeeping—it causes us difficulty—it is, in fact, good for the survival of the species. It’s an situation where you have to look at what is best for the species instead of what is best for us. Does a laying worker have any physical changes that will indicate it is a laying worker? In the cases of laying workers in the past, I have looked and looked for some difference to find a laying worker(s). I have found no pictures on the ‘Net of a laying worker. From the outside, you can see no difference. If you dissect them and compare them to normal workers, you can see the ovaries are larger and more developed. Nice article, great pictures. A small point, from my (limited) experience, eggs on pollen don’t necessarily mean a laying worker. As well as multiple eggs, I have seen eggs that young queens have laid in pollen cells. In some cases an introduced mated queen, so there was no period of broodlessness. Not many eggs, but a few and up to a week or two after she has begun laying. The common factor in the frames that had these eggs was that they had a lot of pollen and little room for laying in. Here, in Ireland, we have usually have lots and lots of pollen coming in so frames close to the brood frames are often 70-80% full of pollen. So it may be something to do with that. I agree. Actually, I don’t think any one sign is definitive. That’s why I like to look for multiple signs of the type I listed. So if you have eggs on pollen and multiple eggs and eggs mixed with larvae, for example, it might be time to take action. If I saw only one sign, or even two, I would be cautious. What bad luck for Edmun on his first hive! But how fortunate that he was able to decide to toss the bees out and buy another colony. I have suffered the laying worker problem a few times in my 10 years or so of beekeeping and the only solution that I have found to work was last year when I successfully embedded some queen cells in the problem hive together with two frames of brood from the queen cell hive. Amazingly it worked! The laying workers accepted the queen cells and the new queen and raised a successful colony from her. Wow , excellent article Rusty! Edmun’s photography is super. Would love to know more about his camera. Thanks for the post! I saw it somewhere. I think is was an Apple iPhone 6. This year our club, thanks to a generous donation of equipment and gear, took on 15 new members to mentor. They’re eager and full of questions, and we hold regular classes for them on inspection, feeding, pest control etc. Well, the subject of laying workers came up, and I was dismayed to hear an experienced beekeeper immediately launch into the “haul & dump” model as “the” way to get rid of :”a” laying worker. Short-cut: I used this method and wasted twenty bucks on a new queen which the hive savagely disposed of. Just sharing one insight: if you choose this method (and our State apiarist, our Ag college entomologist and our biggest seller of nucs all advised me that it’s only successful in perhaps one case in 12), IF – then be sure to leave the hive with the returning workers for 16 to 24 hours, for pheromones from the open drone brood to dissipate, before introducing the queen. Those brood pheromones tell the workers that they’re queenright, and the new queen is an intruder. Open for debate, as always. All of the authorities you mention—your state apiarist, entomologist, and producer—are correct. Dumping a laying worker colony and allowing those bees to return to their original hive will do absolutely nothing to control laying workers. It doesn’t work because it doesn’t change anything. Think about it. Dumping bees and allowing them to return to their hive does nothing more than give them a few minutes of fresh air. Adding a queen to a laying worker hive doesn’t work whether the bees have been out for some air or not. It doesn’t work because the situation that caused laying worker development is still present, that is, there is a lack of open worker brood pheromone. The only purpose of dumping bees is to get rid of them. If you remove (or block) their original hive, most of the bees will scatter into other queenright colonies, and these bees get absorbed into the population with little problem. All colonies, even large healthy ones, have some number of laying workers and this just adds a few more. If you intend to fix the worker hive, a continual introduction of open brood can be successful. Sometimes, combining with a double screen board can do the trick. But the fact remains, you have to reverse or prevent the development of worker ovaries in order for queen acceptance to occur. The thinking behind the method is that with enough distance, the laying workers will not be able to return because the developed ovaries make them too bulky. Indeed when we dumped them, at the other side of the farm, we noticed that a grapefruit-sized cluster gathered on the sheet and did not fly away. They remained there overnight and died in a sad little clump. But I note you mention that it’s open worker brood pheromone that prevents worker laying. So if I had waited, then added a frame of open brood with the new queen, do you think they might have accepted her? No big deal: I just plan to stay diligent about inspecting, to reduce the chance of its happening again. And I will so advise my mentees. Here’s the thing that doesn’t make sense to me about dumping the bees to separate the laying workers from the others. First, I don’t believe the rumor that says they can’t fly. But let’s assume for a minute that they can’t fly, and by dumping the bees away from the hive you can effectively separate the layers from the non-layers. Now, since new laying workers form constantly once the open brood pheromone is gone, you are going to have laying workers in all different stages of development. As soon as you get rid of the ones that are currently laying, new ones will form. So dumping may get rid of today’s laying workers, but not the ones that begin laying tomorrow or the next day. 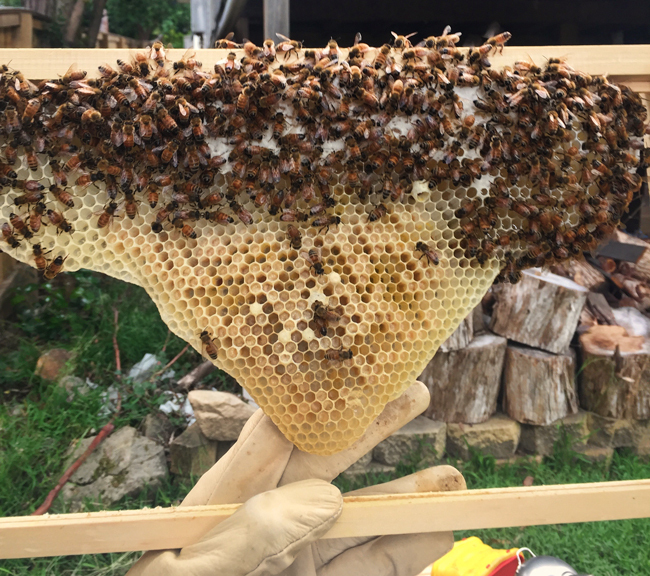 As for queen acceptance, I think you have to keep adding frames of open worker brood, probably for several weeks, until the bees start trying to raise a queen. Then there is a chance they might accept a new queen. But I would still pay close attention to how the workers react to her. If they bite and claw the queen cage, I would back off. Near as I can find, it seams that the theory behind dumping the bees and letting them return was that most of the laying workers wouldn’t fly back. And you’d only get the field bees returning. Then you could requeen the next day or so, after the brood pheromone had dissipated. This comes from Dave Cushman’s writings. He in turn refers back to various other writers going back to the 50’s. But Cushman and the writers he quotes were all dealing mostly with the British black bees. And the British bees often behave a tad differently to the Italians that most of us Americans are familiar with. I’m guessing this technique worked a lot better with the black bees and the people who promote it haven’t realized that there are some subtle differences between the behaviors of the different bee breeds because of them having evolved under (sometimes) radically different conditions. People tend to cause themselves all manner of problems by only looking at the effects of things without considering WHY something works the way it does, in a given situation. See my reply to Nancy. The problem with the theory of dumping to separate out the laying workers is that new laying workers continue to form. As long as there is no open brood pheromone in the hive, new laying workers will be produced. That is why it is necessary to build up the open brood pheromone before trying to introduce a queen. Laying workers will be in all stages of development, and some that aren’t laying yet will start to lay within a few days. The people who believe you can separate the laying workers by dumping don’t seem to realize that more and more laying workers will be formed from the remaining bees as long as there is a lack of open worker brood pheromone. Once you understand the biology, the dump-to-separate system doesn’t make sense. As you say, this is a case of needing to know why the laying workers come about. Wow, very interesting! I had heard of laying workers but this was awesome. Very informative and great pictures to go along with it. Thank you so much! I can tell you all from personal experience, and only having two hives, laying worker hives are no fun to deal with. They killed two queens that I purchased. I did find out in the process that if you use a push in cage with a good mated queen, make it 6 inch x 4 inches, of which is quite large, also make sure there are lots of empty cells, with some honey, and pollen inside the cage, and place 6 to 8 of her workers inside with her, (The new queen), she will have a chance to lay fertile eggs before they eat there way through the comb and kill her, or possibly accept her. If they kill her as they did in my case, the colony will then have a chance to make emergency queen cells from some of the freshly laid eggs and raise their own queen. Quite a timely process I know, but it happened to me, not by design. I had used the push in cage to introduce a new queen to a fresh cut out that had lost a queen and they took to her fine. When I tried it with the hive I described above I had a different result, but still ended up with a queen, so you never know. It just happened to work out for me. Having only two hives of which neither were that strong, I didn’t have the resources to share between them. I don’t know if I would go to that extent again. It was quite costly, and the money may have been better spent on a new colony, Nuc or package, but in late Aug to Sept. they are hard to come by in Penna. This past summer, I had two nucs go laying worker on me. Since I was creating my nucs by introducing mature queen cells to 4-frame splits, I think these two resulted from some early mishap with the first queens, which I had already marked. Once I discovered them, I was able to make them queenright again fairly quickly; one by inserting two frames with good amounts open brood facing each other and putting another mature queen cell on one. The other was done by doing the same with open brood and dropping in a virgin queen that I’d serendipitously found just emerging in a large hive. 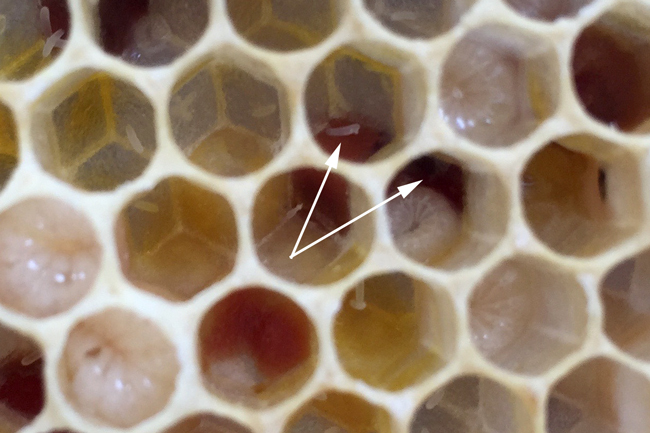 In both cases, I caught the laying worker nucs fairly early when the signs of multiple eggs and eggs on pollen were evident, and drones being capped in workers cells in the central brood frames were just beginning to occur. These were all Russians. Thank you all for your comments and to Rusty for keeping this all organized with a central thread running though it that keeps the conversation from taking on a personality of its own. This is a very difficult subject and as a new beekeeper, just 2 hives this year, it has been challenging to inspect correctly and know what we are looking for and what to do about it. We captured a swarm just two weeks after installing our first hive and then had to add purchased bees with a fertile queen to that swarm. The swarm took well to the added queen and frames of bees from her colony. The ideas here will add to our library of information that must be learned quickly and on the fly for new beekeepers. I have heard that one can use essential oils to mask pheromones in a hive when trying to introduce a new queen. Is there any evidence that these same essential oils would be helpful when trying to solve a laying worker problem? I’ve been thinking about this, but I can’t picture how it would work. We can assume the oil would mask the queen’s pheromones, but it wouldn’t suppress the worker ovaries. Without suppression, the workers will continue to lay eggs. Maybe the queen would lay eggs too, but if the essential oil odor were to fad, I imagine the workers would soon be all over the queen and kill her. If the queen could be protected somehow until the open worker brood pheromone suppressed the workers’ ovaries, say three to four weeks, maybe that would work. On the other hand, maybe I am missing something? Do you have a theory on how it would work? I’ve heard of essential oils and other tactics being used during a standard re-queening. It’s supposed to confuse the workers until the new queen’s scent can spread and make her more likely to be accepted. Kinda sounds feasible in that situation. At least partially. But I can’t see it working in a hive with laying workers. Then again those darned bees don’t always do what they’re supposed to. I was wondering if there was a way to induce a reversal of the behavior and/or the physiology of the laying worker problem. I must say I lack experience; I’m only in my second year of beekeeping and have not experienced a laying worker situation yet. – Dump all the bees into a nuc or box with only frames with starter strips. – After one to three days in the dark, insert a first-year egg laying queen in a cage, which would slowly be delivered by placing fondant at one end. – Feed honey or sugar from an inverted jar or feeder. No pollen at first. – are these laying worker bees, or the whole colony, definitively completely useless? Could they at least build comb? – what would happen to the laying workers if they have no cells to lay eggs in? – what would happen physiologically to the laying workers if there is no pollen been brought in, or pollen/beebread stores, or when the colony exhausts its Fat/Vg reserves ? – what would be the colony’s reaction to a stress situation where they lose all they have built and collected, and have to reorganize themselves from scratch? I have yet to find the answers to that. I could not find any research about “reversing” the condition behaviorally or metabolically. I don’t know if “resetting” the colony is possible. Would it be possible to make the laying workers only busy for the colony instead of caring for their own reproduction? Would the lack of pollen, building comb and festooning, bring changes that would allow a new laying queen to be readily accepted? At the very least I would like to know how good/much comb they could build. Has anybody tried the above mentioned “force them to start from scratch” method, or alike? I hope this was not too boring. More importantly in it he has a link to a very recent publication, August 2016, on laying worker bees and the mechanisms involved. These researchers come to somewhat different conclusions what inhibits worker bees to start laying eggs. Some Notch signalling. I don’t quite understand it. Just wondering where you got your information from about pheromones from open worker brood. But maybe it makes more sense to you and see if you can marry the two sources, i.e. your recommended procedure to re-queen with the results in this article. Other than that I much enjoy your blogs as often being very informative. Rusty, thanks for the great writeup. 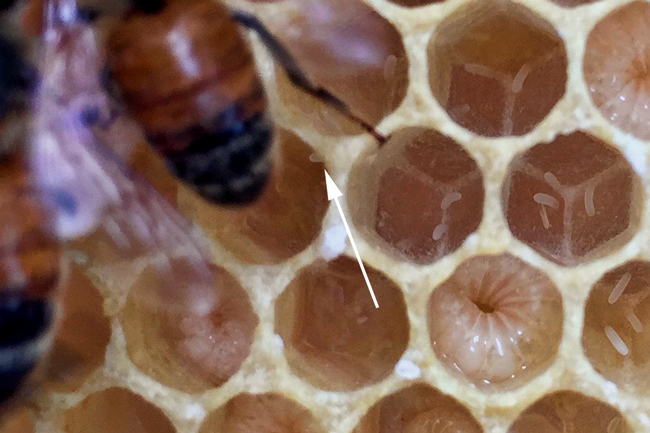 The issue of what a LW looks like: Pheromone issue, and visual comb clues aside, could the answer on proving a laying worker is not a real queen, wouldn’t her stinger be barbed? Couldn’t a person pick up the LW and sting a glove, and if her stinger pulls out you know she is not a real queen? I don’t understand the issue, I guess. A queen looks like a queen, and a laying worker looks like a worker. A month or two ago I realized I had a laying worker hive but was unable to shake them out due to some unforeseen circumstances. Anyway, I looked into the hive today and noticed that all the drone brood has hatched, and there are no more messy cells with multiple eggs. It almost makes me think that somehow the laying workers have died off. Is this something that actually happens or just a rookie misunderstanding? Just some extra information. There is no sign of regular brood either. Essentially the hive is pretty empty besides some left over honey and pollen stores and lots of worker bees. I have one other hive that is healthy and has brood. Now that there aren’t signs of laying workers I am considering introducing a frame or two of eggs/brood with nurses on them to try to revive the seemingly dead hive. Or, perhaps slowly introduce a new queen? I was just hoping for an experts opinion on this idea, or any other suggestions you may have. Doing some pre reading for spring and this article was a great reminder of some of the issues faced by new beekeepers like myself. Thank you so much for sharing your wisdom and insights. And to Edmun as well so we can all learn. In my question from a few years ago, I asked it because I didn’t understand that the size of the LW would not grow to look like at least somewhat like a queen. I mistakenly expected that due to her ovaries no longer being suppressed via absence of Open Brood Pheromone. Since the question I’ve learned much about queen rearing, diet differences of what truly makes a queen (being reared on royal jellly which is a diet absent of p-coumaric acid) and full development of ovaries, followed by mating. Thanks for the superb articles.